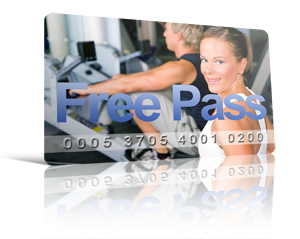 Get Your Free Pass Now! Just enter your name and email address in the box below. We're looking for members who are interested in a variety of exercise equipment, superb personal instruction, an atmosphere conducive to productive exercising, and most of all, RESULTS. Our members don't want to pay for seldom used and counter productive amenities such as steam and pint size pools - and they don't We offer everything your body will ever need, nothing that your body won't ever need. And that's how we CHARGE LESS while providing more. No other fitness center even comes close. Both warm to the beginner and advanced fitness enthusiast. You won't find a shortage of equipment in our spacious workout center. Enjoy the more than full selection of free weights, resistance and leverage equipment for leading companies such as Cybex, Nautilus, T.K., David, Kieser, Flex, lifefitness, Hammer, and Bodymasters, as well as one-of-a-kind custom pieces. Our qualified staff will keep you motivated while giving you your proper instruction on the exercise program of your choice. They will also answer any questions relative to your fitness goals.